Therefore, the European Society of Clinical Microbiology and Infectious Diseases working group on bloodstream infections and sepsis (ESGBIS) is currently designing a project for the development of a COS in BSI/S. Overall timetable: 2 year from first meeting. The ESGBIS group is composed by approximately 30 people with different backgrounds (infectious disease, microbiology, intensive care medicine, epidemiology and statistics). 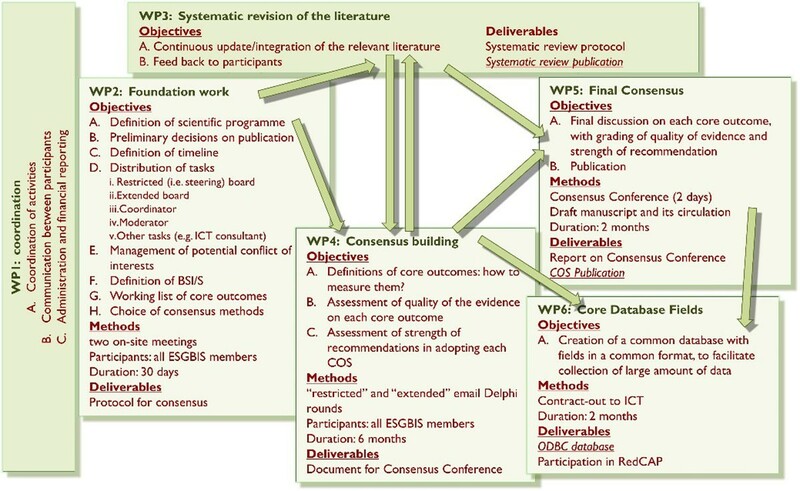 We will adopt a combination of methods: two preparatory meetings, restricted and extended Delphi rounds (via email exchanges), semi-structured interviews with patients, systematic review of the literature, final consensus conference (Figure 1). Publication of the systematic review and of the COS in medical journals and development of a standard set of database fields, to be included in eCRF of future studies.